tThe Kansas-Oklahoma-Missouri league or KOM for short was founded in 1946 in a period in which minor leagues popped up like mushrooms. Like many of those minor leagues, the KOM league did not last a full decade as it folded at the end of the 1952 season. The Kansas-Oklahoma-Missouri League got a class D rating when it was founded. In the specific era of the late 1940s and early 1950s, baseball was king in small-town America. The KOM League filled a void that was left when several leagues in the area folded due to World War II. Many veterans from the European and Pacific theaters played in this league. They easily mixed with baby-faced players that just got out of high school. Most of the charter cities lasted the full run. In a time when you could get a full weeks groceries for $20, when you could get a 1000 mile roundtrip on a Greyhound bus for $10, going to the movies would cost you $0.35 and a Coke cost you a nickel, baseball returned to small-town America. Minor League baseball was booming as people wanted to forget the hardships of WWII. The mode of transportation in the KOM League was the bus. In the era of the Kansas-Missouri League, not much attention was given to the minor leagues by the big national newspapers. Photographers were only around at the start of the season when team photos had to be made. Most of the time, these photos were the work of amateur photographers. Only once did a KOM player get national attention, but that was merely by accident. It was during Opening Day of 1947. Jim Morris was pitching for the Miami Owls and he defeated the Carthage Cardinals as he threw a no-hitter. As a coincidence, league president E.L. Dale attended the game and afterward, Morris stood next to Dale as the picture was taken. The film was sent to Kansas City, where the photo appeared in a big newspaper. The1946 championship series was tied at three between the Iola Cubs and the Chanute Owls. Chanute won the seventh game but that game was later called a non-game due to inclement weather, so the 1946 championship series was never settled. 1952 – league folded during the championship series when Miami led 2-0. 1947 was the year, the Kansas-Oklahoma-Missouri League expanded from six to eight teams. Ponca City, Oklahoma, and Independence, Kansas entered the league as farm teams of the Brooklyn Dodgers and the New York Yankees. There is a tale linked to the Ponca City Dodgers. In the inaugural season of the league, the Brooklyn Dodgers sent some players to Miami, Oklahoma, to play for the local Blues. The team however wasn’t led by a local but by someone from Amarillo, Texas, Ted Vernon. When it was discovered that Vernon led the club, the president of the National Association of Professional Baseball Leagues, Mr. Bramham, sent a stern letter to the Blues about the rules being violated. As a result, the Dodgers pulled their players and sent them to Ponca City next year, where the local club would become the farm team of the Dodgers. While most teams were farm teams of major league teams, the Miami Owls were the farm team of a minor league team. The Topeka Owls of the Western Association were the parent club. Dirty uniforms were the norm for many KOM League teams. The clubs started their road series with clean uniforms but they were not washed until the end of each road trip, which often lasted a week. the difference between first and third place was a game and a half. The Independence Yankees won the KOM League pennant again by beating the Ponca City Dodgers 3-1. A certain kid from Commerce, Oklahoma was placed on the roster of the Yankees. The kid would get the nickname “the Comet” which was later connected with the name of the town he came from: “the Commerce Comet”. Two years later after a 40-game stint with the Yankees’ AAA team, this kid, better known as Mickey Mantle would make the roster of the New York Yankees where he would stay for eighteen years. 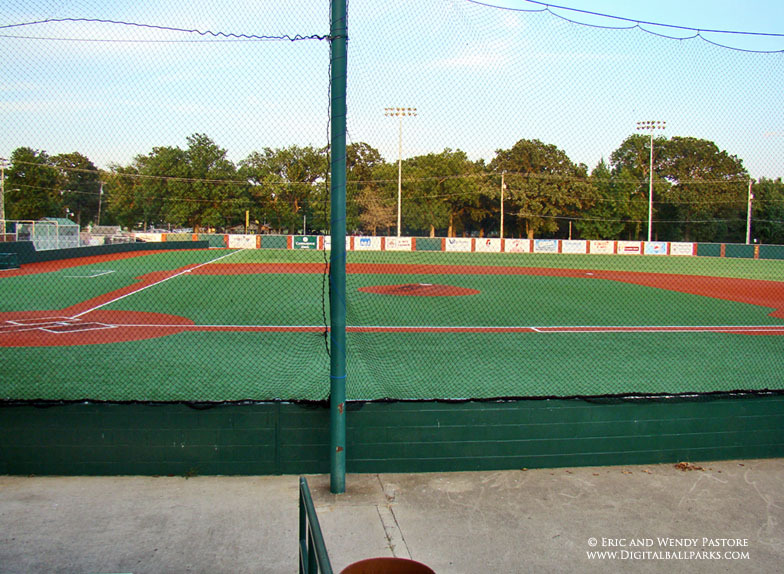 After the 1950 season, the league shrunk to six teams again as the Chanute and Independence franchises folded. Until 1952, the Kansas-Oklahoma-Missouri League was a rather stable one. But in 1952 several teams moved from one place to another, which was the omen of worse to come. The Carthage Cubs moved to Blackwell, Oklahoma, the Pittsburg Brownies moved to Independence, Kansas and the void left in Pittsburg was filled by the Pirates, who left Bartlesville, Oklahoma. When the playoffs started, the Miami Eagles led the series 2-0 vs the Ponca City Dodgers. But during that series, all the teams and the league itself folded, which signaled the end for the league.